First Christian Church hosted the interim site for Benedict House (November 2005 to April 2006), a homeless men's shelter now located in West Bremerton. We now donate our time and resources one week in May by preparing and serving meals at Benedict House. Other Churches, groups and individuals can donate their time and resources in several ways: donations of food or money, prepare meals. For more information, please contact Catholic Community Services at(360) 405-9486. First Christian Church has had a long history with the Bremerton Foodline. We support them in several ways - through monthly food campaigns where certain items are targeted for donations, through monthly financial giving and through individual designations. On the third Monday of each month, we deliver a meal to The Coffee Oasis Teen Shelter which feeds about 30 kids. We partner with Bay Pointe Retirement which provides the main dish. Please contact The Coffee Oasis at 360.377.5560 for more information. Helping Hands is unique to our church. We created it as a way to lend a hand to those in need. People in need must go through an evaluation process for support. Shawls ... made for centuries are universal and embracing, symbolic of an inclusive, unconditionally loving, God. They wrap, enfold, comfort, cover, give solace, mother, hug, shelter and beautify. http://www.shawlministry.com/. Shawls are initially donated to those in need of prayerful support within our own congregation & then to a larger extended community family based on supply & need. These very basic shawls may be knitted or crocheted. Volunteers may bring yarn that they wish to donate to make a shawl, we also have donated yarn to use. Yarn should be soft, preferably machine washable. Knitted shawls require 555 yards & crocheted shawls require 740 yards of yarn. Knitting needles (sized 11 - 15) would be helpful, but we do have a few sets to loan if needed. For those not interested in knitting, but would like to support the ministry, donations of yarn would be gratefully accepted. 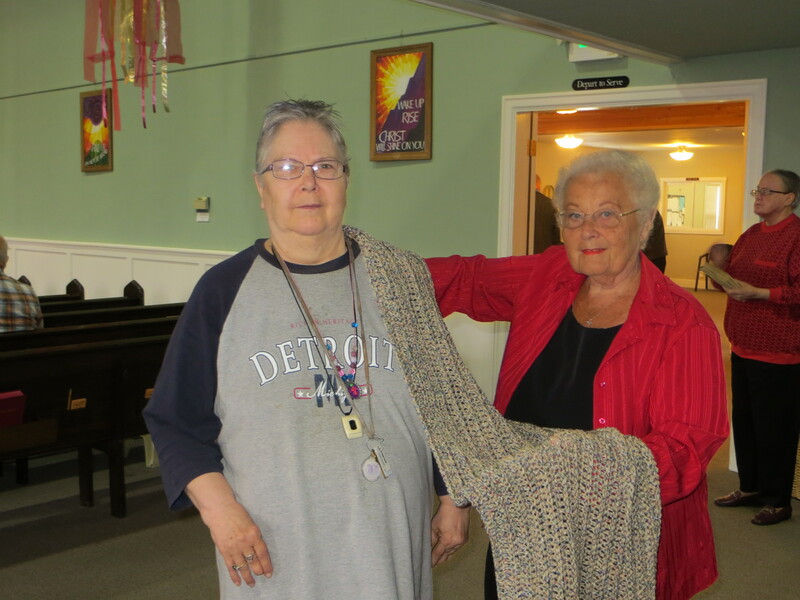 The Prayer Shawl Ministry meets quarterly at First Christian Church. For additional information, please contact the church office at 360-373-2444. In February we conduct a fund raising campaign for the Week of Compassion, an outreach department of our denomination, which provides assistance throughout the world in times of disaster, war, and extreme human need. Donations can be made at anytime by designating your offering to Week of Compassion. This ministry is ongoing in its assistance to the many areas of need.